Internet users have a variety of format options in which to store their movies, and biologists have now joined the party. Researchers have used the microbial immune system CRISPR–Cas to encode a movie into the genome of the bacterium Escherichia coli. The technical achievement, reported on July 12 in Nature, is a step towards creating cellular recording systems that are capable of encoding a series of events, says Seth Shipman, a synthetic biologist at Harvard Medical School in Boston, Massachusetts. While studying brain development, Shipman became frustrated by the lack of a technique to capture how cells in the brain take on distinct identities. This inspired him to explore the possibility of making cellular recorders. To develop such a system, however, his team would need to establish a method for recording hundreds of events in a cell. Shipman and his colleagues, including Harvard geneticist George Church, harnessed the CRISPR–Cas immune system best known for enabling researchers to alter genomes with relative ease and accuracy. The team designed its system so that these snippets corresponded to pixels in an image. 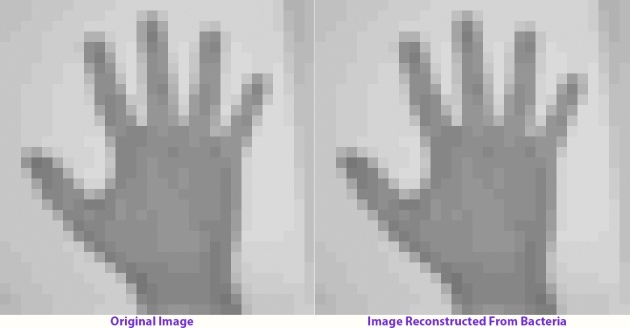 The researchers encoded the shading of each pixel—along with a barcode that indicated its position in the image—into 33 DNA letters. Each frame of the movie consisted of 104 of these DNA fragments. The movie that the researchers selected consisted of five frames adapted from British photographer Eadweard Muybridge’s Human and Animal Locomotion series. The photos show a mare named Annie G. galloping in 1887. The team introduced the DNA into E. coli at a rate of one frame per day for five days. The researchers then sequenced the CRISPR regions in a population of bacteria to recover the image. Because the CRISPR system adds DNA snippets sequentially, the position of each snippet in the array could be used to determine the original frame to which the snippet belonged. Other CRISPR–Cas systems can convert RNA into DNA that is then inserted into the CRISPR array. This could open up the door to using the arrays to track gene expression without cracking cells open to remove their RNA, Platt notes.